Coach shoes are high-quality, designer shoes. Due to their stylish designs and fine materials, Coach shoes carry high price tags. As with most designer items, there are plenty of replicas in the marketplace. You don't want to be fooled into buying fake shoes when you think you are buying the real thing. Here are some ways to spot fake Coach shoes. Look up the name of the shoe's design on the official Coach website. 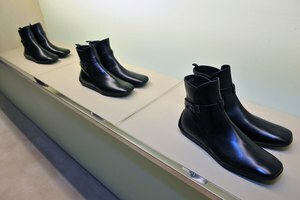 Every shoe style will have a name and a number attached to it. If the shoes you're looking at are not a valid Coach design, then they are most certainly fake. Inspect the logo on the shoes. If the shoes have a signature Coach pattern, make sure the print features capital Cs. Sometimes replicas will have capital Gs instead. Examine the shoe's stitching. Coach shoes will feature sturdy, clean stitching. If the stitching looks flimsy, cheap or crooked, the shoes are likely fake. Feel the shoes' material. Coach only uses top-quality leathers, fabrics and suedes for its products. If the material on the shoes feels lightweight or overly stiff, you are most likely dealing with replica shoes. Examine any hardware on the shoes such as buckles or buttons. 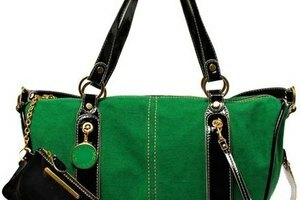 Coach hardware is generally made of brass, nickel and gunmetal and is very solid and well-made. Cheap hardware is a surefire way to spot fake products. Scrutinize the base of the shoes. If there appears to be any excess glue on the edges of the shoes' interior, then they are not likely to be authentic. Coach products will not feature sloppy craftsmanship. Check for any misspellings on the shoes' label. The label's text should be clear, evenly spaced and aligned. If the text appears sloppy, uneven or contains typos, the shoes are not authentic. If you purchase your shoes from an authorized Coach retailer such as Nordstrom, then you can rest assured that the shoes are authentic. When buying on eBay, ask the seller to confirm the authenticity of the shoes prior to bidding. Beware of online sellers that use stock photos rather than photos of the actual shoes they are selling. Ask to see a photo of the actual shoes for sale.